Specialized rooms make for easy, organized gear storage, and might also double as a home gym or yoga space. THE GREATEST SPORTS/gear room I ever saw was in a townhouse my brother rented. Who knows what the original intention for the space was, but it made the perfect gym and storage area, with four walk-in closets lining one wall. He could stash his equipment and also had a huge, open space for working out. You don’t often luck into a gear room like that. In most homes it seems as if such a space is an afterthought, with architects, owners, and designers spending more time on living rooms, kitchens, and master bedrooms and baths. 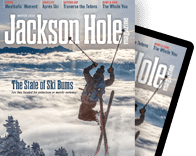 But for many people—especially Jackson athletes—a sports-specific room is one of the most important, most loved, and most used rooms in their home. To help come up with the design for the gear vault, Logan peppered Stanwood with questions. What time did he get home? What did he carry through the front door? What worked in his current home? What didn’t? Stanwood’s answers resulted in the vault, with its hooks, shelves, drying racks, space, and, most importantly, the sliding doors that hide it all. For Stanwood, those doors have been enough to make his home feel organized and spacious, and that’s just what he wanted. NOT ALL SPORTS-specific rooms stop at storage. Carney Logan Burke designed a gear barn for a home near the airport. 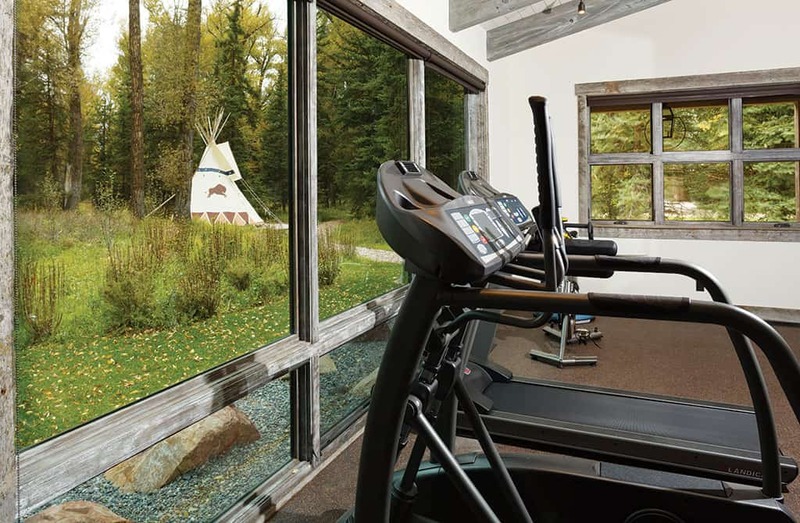 The barn has a workout space with a treadmill, stationary bike, Stairmaster, and weights, plus space to store the family’s skis, bikes, and other equipment. It also has an entertainment room with cushy, overstuffed chairs and surround sound. 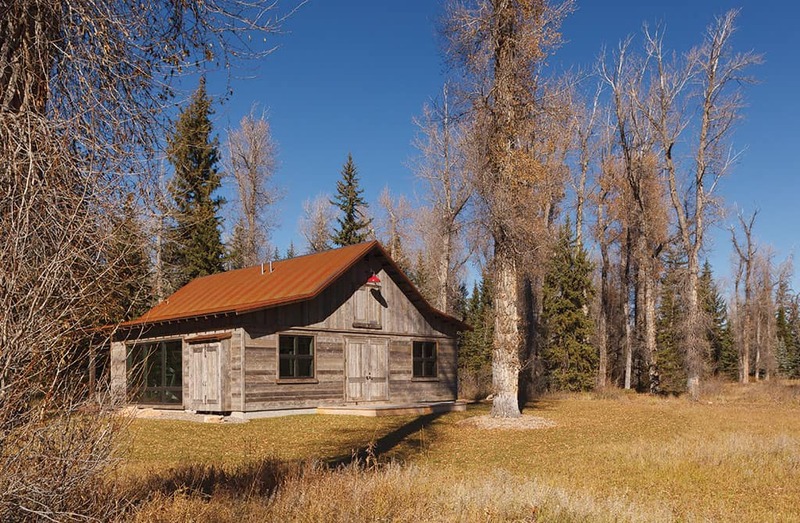 BUILDING HOMES IN Jackson Hole naturally invites interaction with place. In such a spectacular setting, designers and homeowners want to bring the outside inside. Margot Snowdon’s home in the John Dodge subdivision off Teton Village Road is focused around large banks of windows that open out over a pond surrounded by native grasses with the Snake River in the near distance. A longtime yoga instructor who, years ago, opened the state’s first yoga studio, Snowdon wanted her home to include a private place to practice yoga that captured a sense of peace, quiet, and serenity. In response to that desire, Logan designed a simple, spare room with a north-facing wall of windows. The room is painted white, and the floor is made from a blonde wood. A small alcove in the west wall serves as a spirit shelf. When I visited, Snowdon had a photo of B.K.S. Iyengar, with whom she’d studied and who had recently died, propped up next to candles. A blue yoga mat lay out on the floor, ready for use.